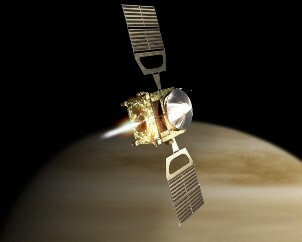 Artist’s impression of Akatsuki in orbit around Venus. On 8 December 2010, the Japanese Space Agency (JAXA) announced that their Akatsuki probe had failed to achieve orbit around Venus. Having successfully launched six months prior, it’s trajectory had led it on a long curving path towards Venus. To enter Venusian orbit, it needed to reduce speed by firing its main engines forward for 12 minutes (a maneuver called an Orbital Insertion Burn). It would then have been perfectly positioned to drop neatly into orbit around Venus. Unfortunately, 152 seconds into the burn, fuel pressure to the engine dropped suddenly causing the engine to lose power. The reduced thrust caused the probe to lose balance and begin spinning slowly. As soon as the onboard control systems detected the spin, they immediately shut down the engines and went into safe mode. It was some time before JAXA ground controllers realised that anything had gone wrong, as the burn took place just as Akatsuki swung behind Venus, and the craft’s slow spin meant that its antennae were only pointed at earth for a few seconds every ten minutes. The intermittent communications made it extremely tricky to regain contact with the orbiter, and it was some time before it could be stabilised. Now, three weeks later, the post-mortem is complete. The problem seems to have been caused by a faulty valve in the fuel system’s plumbing. Although the engine used a new design incorporating such unique features as a ceramic thrust nozzle, the specific valve was an off-the-shelf model which has been used without problem in many space missions before. In other words, it seems Akatsuki suffered the same bad luck that has plagued many of it’s other missions.